Whether you’re across the country or just down the road from your loved one, helping keep them safe in their home is a high priority. For most, however, the idea of bringing in outside help can be upsetting. Below are some common tips you should try with your loved one to help alleviate the impact of introducing a trained caregiver. Try hiring the caregiver for light housekeeping, laundry, cooking and running errands, at first. This will help taper the stigma that the caregiver is there to chaperone them. Once you or your loved one are comfortable with their presence and appreciate their current level of service, you can begin to introduce other services. It may take you or your loved one some time to come to terms with needing extra help. It is possible to make the situation advantageous, though! Explain that they’ll gain independence. If they were once house-ridden or dependent on family or friends for rides, a caregiver can now provide them with those services. They can have reliable transportation at their fingertips, whether it be for social outings and shopping trips or doctors visits and errands. Necessary aids such as glasses, canes/walkers, etc. You and your loved one are in good hands. Founded in 1990, Granny NANNIES maintains a commitment to excellence and a strong dedication to treating clients with the highest level of respect and dignity. 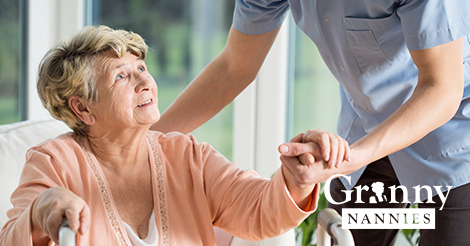 Granny NANNIES offers home health care services 24 hours a day, seven days a week, or as needed, for all ages and levels of care. For more information on quality, trustworthy, reliable and affordable care, call 800-316-2669.